Anybody who was around in the mid-1980s probably remembers the introduction of the Where’s Waldo? series of books, which became a mass cultural phenomenon in 1987. The books feature a series of two-page spreads drawn by illustrator Martin Handford, in which the title character in his signature red-and-white striped shirt is hidden among dozens of other figures in complicated comic scenes. The goal is to find Waldo and several other recurring characters in each of the scenes. The task gets more and more difficult as the books go along, with Waldo only partially visible in the later volumes (there are at least six), and other characters in red and white crowding the scene. Where’s Waldo? is the most famous example of a large genre of find-the-hidden-object books and games aimed at children and some adults — the numerous I Spy books by Walter Wick and Jean Marzollo, using photographs of large collections of toys and other small objects, are another staple of children’s book stores. Our five-year-old daughter is a big fan of both Where’s Waldo? and I Spy, and is often better at locating the target objects than I am. Her two-year-old brother doesn’t quite have the idea of finding Waldo yet, but finds the pictures fascinating, and delights in pointing out larger objects. While such books may seem like merely an amusing diversion for children, the mental process involved in finding Waldo and his friends in Handford’s elaborate drawings is remarkably sophisticated. There are multiple web sites and academic papers devoted to computer algorithms for locating Waldo within Handford’s drawings, using a variety of software packages, and these are impressively complex, running to hundreds of lines of code and invoking sophisticated image-processing tools. Child’s play, this is not. The essential element of these books is pattern matching, looking for a particular arrangement of colors and shapes in the midst of a distracting field. There are numerous more “adult” variations on this game, some of them obvious, like the image-based “hidden object” puzzle games Kate sometimes plays for relaxation, or the classic video game Myst. Other classes of games may not seem directly connected, but use the same pattern-finding tricks, such as solitaire card games like Free Cell (my own go-to time-waster) or colored-blob-matching games like the massively popular Candy Crush. In all of these, the key to the game is spotting a useful pattern within a large collection of visual data. This is a task at which human brains excel, and millions of people do it for fun and relaxation. The unmatched ability of humans to spot meaningful patterns in visual data is the basis for many scientific discoveries, in all sorts of different fields. Probably no field has benefitted more from pattern-matching than astronomy, though, with many of the field’s most important and unusual discoveries having their origin in the spotting of an odd pattern. Every human civilization we’re aware of has studied astronomy at some level, noticing patterns in the motion of the various lights in the sky. The simplest astronomical observations concern the rising and setting points of the Sun over the course of the year, and these have been recorded in monumental architecture on several different continents. The motion of the planets is a bit more complicated, with patterns that require several years to repeat, but again, civilizations in Asia, the Mediterranean, and South America all tracked and predicted the motion of planets over long stretches of time. As the tools used to observe the sky became more sophisticated, the sorts of changes studied by astronomers became smaller and more subtle. Rather than tracking the motion of objects across the whole sky, they began to focus in on the behavior of smaller pieces of the sky, and changes in single stars and small groups of stars. From the late 1800s through most of the 1900s, the primary tool for studying astronomy was the glass photographic plate. Astronomers would point their telescopes at a particular region of the sky night after night, and record images of all the light coming from that area. These plates could accumulate light for hours at a time, picking up objects far too faint to be seen by the human eye and revealing a vast range of new types of celestial objects for astronomers to study and classify. As this was new technology, numerous surveys of the sky were launched, collecting many photographic images covering the entire sky, and repeating the process many times to look for changes in the arrangement or brightness of the various objects detected. Of course, vast numbers of faint objects showed up on these plates, and sorting out which of them were actually interesting was a difficult task, requiring careful study of dozens of images of tiny dots. This was tedious and low-status work, and often fell to poorly paid or even volunteer women working as “computers” at the world’s great observatories. They would spend long hours poring over astronomical images, noting important features to serve as data for the better-paid male astronomers who ran the observatories and did higher-level analysis. Several of these women made ground-breaking contributions to astronomy, particularly Annie Jump Cannon who over her career mapped and classified more than 300,000 stars, and developed the stellar classification scheme still used today. One of the “computers” employed at the Harvard Observatory was a woman named Henrietta Swan Leavitt, who had discovered astronomy as a student at Radcliffe College (the women’s college associated with Harvard) in the early 1890’s. A severe illness shortly after graduation left her profoundly deaf, but when she recovered, she volunteered at the Harvard Observatory, then was hired full-time in 1902 for the wage of $0.25/hour, working seven hours a day, six days a week. She developed a good reputation even among the talented staff at the observatory — Margaret Harwood would later remark that Leavitt had “the best mind at the Observatory” — and was charged by the director, Edward Pickering, with studying the plates sent from Harvard’s Southern Hemisphere observatory in Peru, looking for interesting stars. In looking over these plates, Leavitt noticed an intriguing pattern in a class of stars known as “Cepheid variables,” that would end up radically transforming our understanding of the universe. As the name suggests, Cepheid variables are stars whose intrinsic brightness changes in time; the first studied in detail was located in the constellation Cepheus, which supplies the other half of the name. The intensity variation is now known to be driven by an oscillation in the size of the star — the outer layers of gas pulse in and out in a regular way, heating up and expanding, then cooling and contracting. As the star expands it brightens, and as it contracts, it dims. Leavitt took an interest in these variable stars, and identified over 2,400 of them in the course of her observations. While doing this work, she noticed a pattern in the oscillation: the brighter Cepheid variables in her images seemed to take longer to go from bright to dim and back again. On her own initiative, she set out to test whether this apparent pattern was real. Of course, there are many confounding factors when it comes to establishing the actual brightness of stars, chief among them being the effect of distance. When we look at the light from the sky, we see a two-dimensional projection of a three-dimensional universe, with no easy way to establish the distance along our line of sight. A dim object on the sky might be dim because it intrinsically has a low luminosity, or it might in fact be a very bright star that is simply very far away from us. To get around this problem, Leavitt concentrated on some 25 Cepheid variables in the Small Magellanic Cloud. This is now known to be a small satellite galaxy orbiting our Milky Way; at the time, all that was known was that it was a large group of very distant stars, sufficiently distant that the depth of the cloud is insignificant compared to the distance to the cloud. For all practical purposes, these 25 stars were all the same distance from Earth, and thus their relative brightness could safely be assumed to reflect real differences in the intrinsic luminosity of the stars, and not mere distance. Within this set of comparable stars, Leavitt’s painstaking observations showed a clear relationship between the period of the variation and the luminosity of the star. The brighter the star, the longer the period, in keeping with a clear and simple mathematical formula. This might seem a mere curiosity, but in fact it was a revolutionary discovery, because it gives a way to establish the intrinsic luminosity of a Cepheid variable from simply measuring the period of variation. And if you know both the intrinsic luminosity and how bright the star appears to be, you can easily determine the distance to Earth. Leavitt’s results were published (under Pickering’s name, but the work was widely known to be hers) in 1912. In 1913, Ejnar Hertzsprung measured the distance to a handful of Cepheid variables in the Milky Way. Putting these two results together enables Cepheid variables to serve as “standard candles,” allowing accurate distance measurements over the scale of galaxies. Harlow Shapley combined these results to establish the distance to some globular clusters, setting the scale of the Milky Way, then in 1924, Edwin Hubble used Leavitt’s relationship to radically transform our understanding of the scale of the universe. Hubble spotted several Cepheid variables in what was then known as the Andromeda spiral nebula, whose brightness allowed him to measure the distance to Andromeda at more than a million light-years. This was well outside the bounds of the Milky Way established by Shapley’s measurements, and established conclusively that Andromeda was not, in fact, a nebulous collection of gas within our own galaxy, but a separate galaxy in its own right. This ruled out the theory, favored by Shapley, that our galaxy represented the entire universe, making it merely one of a vast number of galaxies, separated by mind-boggling distances. Hubble wasn’t done using Leavitt’s discovery to transform astronomy, though. In 1929 he announced another incredible discovery: using Cepheid variables (among other methods) he showed a clear relationship between the distance to a galaxy and the rate at which it appears to be moving away from us. “Hubble’s Law” is clear evidence that the universe as a whole is expanding, and led directly to the modern Big Bang cosmology, the idea that the universe began as a single hot, dense point some 13.7 billion years ago, and has been expanding and cooling ever since. Numerous other lines of evidence have since been found supporting the Big Bang model, but it begins with Hubble’s relationship between distance and speed. Most of the chapters of this book conclude with examples of ways you can employ lessons from science in your everyday life and activities, but this chapter is slightly different. Rather than offering a way to use scientific thinking to better your life, I’d like to offer an invitation to use your everyday thinking to help science. In 2009, the Galaxy Zoo team expanded their project to provide a platform for a wider range of projects using the same citizen science template: volunteers go to the website, choose an interesting-sounding project, and are presented with data of one sort or another, and asked to spot a pattern. By combining the efforts of thousands of volunteers — nearly 800,000 people have registered with the Zooniverse — they look for crucial signals in the sorts of data where human brains are superior to computers. There are Zooniverse projects to suit all manner of skills and interests, and all of these projects rely on tasks that are fairly trivial for human volunteers. In most cases, it takes no more than a few seconds to evaluate a given candidate. Some of them are also weirdly addictive — clicking through dozens of light curves in Planet Hunters has proven to be a fantastic way for me to procrastinate on any number of writing projects. None of them require any particular background knowledge — you don’t need to be able to read Greek to match up characters in Ancient Lives, or know much about astrophysics to categorize galaxies — though participating in the projects will often lead to learning something about the subject almost by accident. I know a good deal more about the operation of stars than I did prior to researching these projects, just from reading the discussion pages about some of the odder light curves in Planet Hunters. The Zooniverse is one of the largest collections of “citizen science” projects, but there are many other options, both single labs and large collections. These range from almost completely passive projects like SETI@Home and Einstein@Home, which use the idle time of participants’ computers to run automated routines sifting through large data sets, to projects requiring a high level of engagement, like the array of bird-watching activities operated by the Cornell Lab of Ornithology. There are even more commercial operations like Dognition, which offers a “personality test” for your pet as a way of amassing a large set of data for researchers at Duke studying the mental abilities of dogs. The website SciStarter offers a large index of projects from many different organizations. Several of these projects also incorporate game-like elements, offering rankings and achievements to be unlocked. These games involve a fairly minimal investment of effort, comparable to what many people put into FarmVille, Candy Crush, and other social-media games, though vastly less irritating to your friends and relations on Facebook. Using them, and the unparalleled pattern-matching ability of your own brain, you can help advance the progress of science during your spare moments at any computer with an Internet connection. 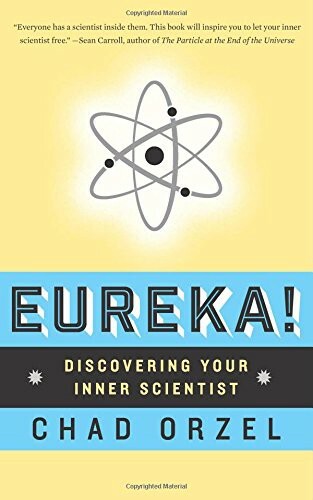 Excerpted from Eureka: Discovering Your Inner Scientist by Chad Orzel. Available from Basic Books, a member of The Perseus Books Group. Copyright © 2014. Available for purchase from Amazon, Barnes & Noble, and your local independent. These were originally published in the UK as Where’s Wally?, but for unfathomable reasons the name was changed for the US edition, which is the one I know. The same thing had happened to Annie Cannon, coincidentally, and the two worked together for a time. Even today, about one in ten of the well-studied variable stars known to astronomers were first studied by Henrietta Leavitt. We estimate distances to everyday objects by comparing the slightly different images from our left and right eyes; the apparent position of an object will change from one eye to the other, with the effect being most pronounced for nearby objects. You can demonstrate this by holding a pen out at arm’s length, and looking at it with first one eye closed, then the other. The distances to other stars are so great, however, that even comparing the apparent position of stars seen from opposite ends of the Earth’s orbit produces exceedingly small change. While astronomers looked for this “stellar parallax” starting around the time of Copernicus, the first successful measurement wasn’t made until the 1800’s. In recognition of this, the Swedish mathematician Gösta Mittag-Leffler wanted to nominate her for the 1925 Nobel Prize; alas, she had died of cancer in 1921, and the Nobel is not awarded posthumously.